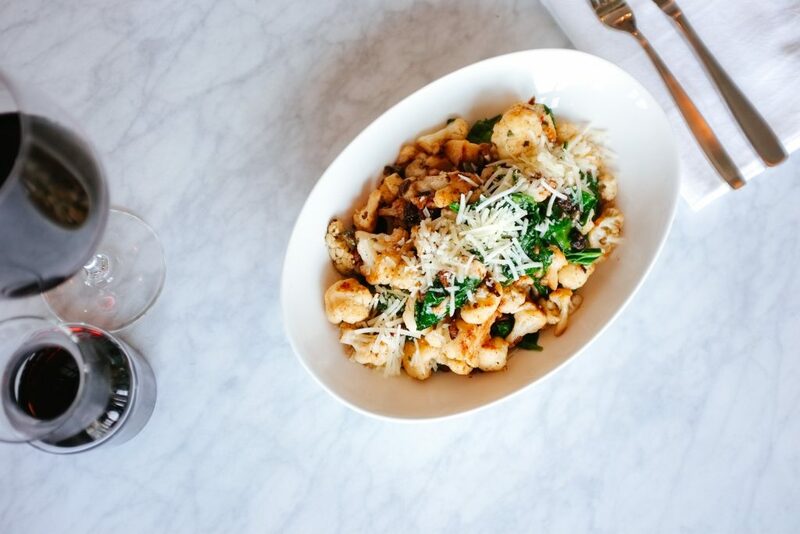 Whether you’re a social diner or down for a solo foodie challenge, Calgary is packed with family-style dining options and shareable plates to satisfy any hunger pang. We found 25 of the best dishes in the city to share in a pair, a party or between you, yourself, and, well, you. What’s not to love about Bridgette Bar? Not only are the staff friendly and the interior stunning, but the food is to die for. With items like the Chicken Sausage Pizza, there’s no wonder it’s such a hotspot in the city. The house-made sausage shines with flavours of a garlic bechamel and mushroom, heightened by a slight punch of jalapeño. Truly a match made in heaven. This is one big salad, and that’s perfectly fine with us. Not only is it filled beyond the brim with charred cabbage and greens, it’s also topped with the perfect helping of avocado, crunchy seeds, and mint, finished with a citrus burst to supplement the other flavours. If every salad tasted this good we’d all be vegetarians. Be sure to join us on Sunday, February 4th to watch the Big Game! 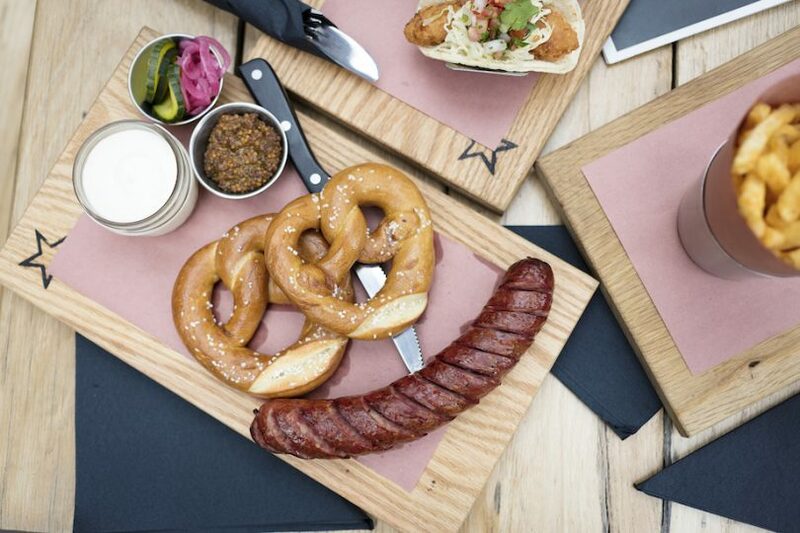 We'll have the TVs on with sound and plenty of shareable snacks like our Grilled Kielbasa Sausage Board! As we approach warmer weather, so too do will we find ourselves adding afternoon’s on National’s wonderful patios to their list of eclectic activities. What pairs perfectly with a day spent bowling? The Grilled Kielbasa Board. 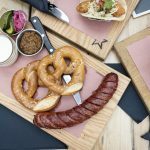 It features a kielbasa sausage, warm pretzels, a beer cheese spread, pickles, and stout mustard to tie it all together. What could be better? Blanco Cantina has some seriously unique approaches to the typical nacho plate. The Tuna Poké option has yellowfin tuna topped with cucumber, jalapeños, sriracha aioli, and red pepper, all served on corn chips for $19. It’s light and refreshing, though there are always other nacho options if that’s your preference! Pfft, and you thought they were lying about the name? Seriously, get down to the Palomino Smokehouse for your fill of delicious smoked pork, sausage, chicken, beef brisket, ribs, slaw, fries, beans, cheddar grits, bacon wrapped corn, potato mash, and Kentucky bourbon apples… just bring a few friends or you might not make it out. Calgary is so glad to have Anju. 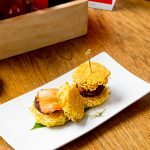 They’ve learned to perfectly execute a variety of Korean tapas, complete with complex flavours and mixes you never dreamed could work together. 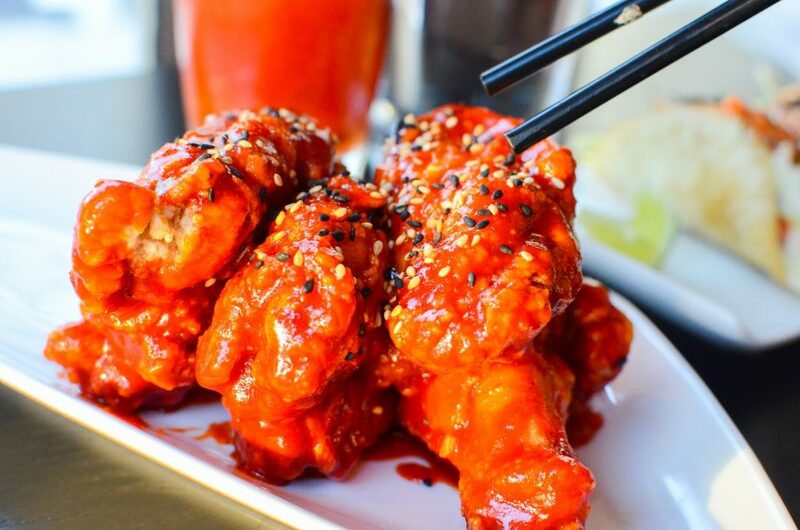 Their wings are no exception: crunchy, hot, and tossed in delectable sauces (try the Gochujang flavour). Just the way they should be. Known for their delectable culinary combinations, Frenchie Wine Bar will satisfy every craving for a cheese fondue with several varieties to choose from. Each is a contemporary take on the tried-and-true favourite with an added bonus of locally sourced cheese from Peasant Cheese Shop. What are you waiting for? Head on into Frenchie! What better to follow a Cheese Fondue from Frenchie than the Chocolate Fondue from Monki Bistro? Served with fruit, waffle crisps, and brioche bites, this dish is so decadent, you’ll be crawling back for more — whether it’s for brunch or dessert. Don’t roll your eyes! This is leagues better than the age-old cauliflower you choked down as a kid. 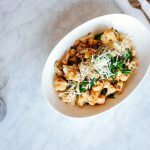 It features bursts of flavour from capers and raisins, crunch from fried chickpeas, and pecorino cheese and sage to heighten the flavour. It’s certainly a step above your run-of-the-mill, garden-variety cauliflower, that’s for sure. Perhaps one of the most fascinating takes on a burger that we’ve seen in a long time, Goro + Gun’s Ramen Burger is one to write home about. 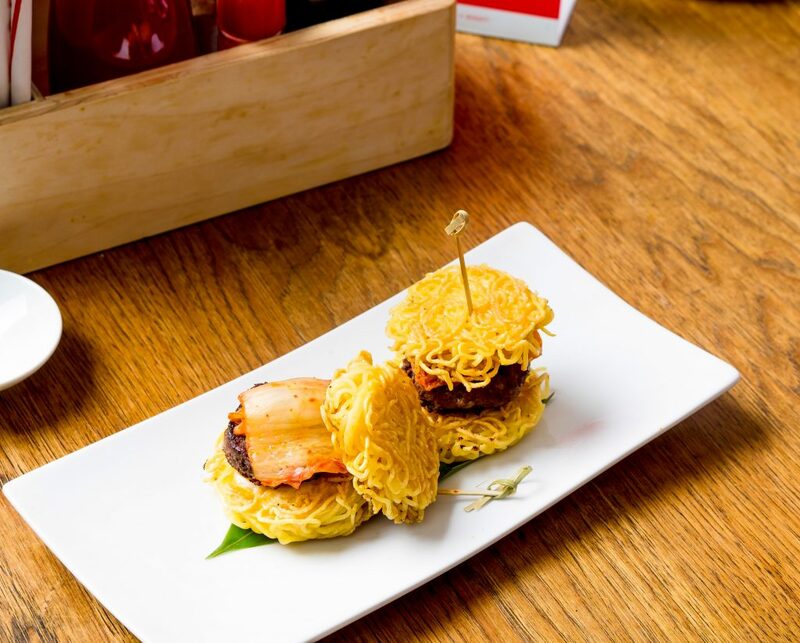 It’s got wagyu beef, kimchi, garlic aioli, and unagi sauce, all served on a fried noodle ‘bun’. While it’s far from traditional, it’s also far from disappointing. 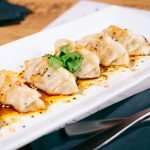 So you think you’ve had gyoza like these before, eh? Well, we’re happy to introduce you to Local 522’s version. Pork gyoza is drizzled with chilli oil, and cilantro, before being scattered with sesame seeds. This dish is close to our hearts: a spicy, tangy, and flavourful punch, all packed in a crispy wrapper. Mezedes (or meze) are small dishes in Greece known to go well with good conversation, taps flowing with beverages, and great company. This one has calamari, spanakotiropita (spinach and feta), dolmades, tiropita, keftedes, tzatziki, and even some pita bread to go along with it all. It makes for a perfect starter for your evening out. 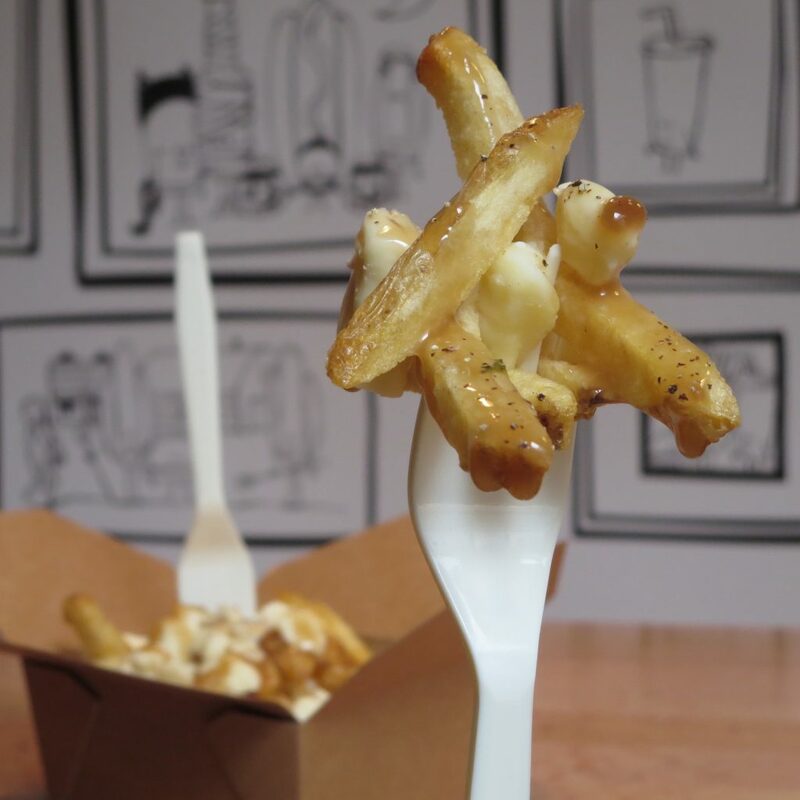 While Canada may be the Land of Poutine, Clive Burger sets the bar unexpectedly high… honestly, it’s almost not fair. 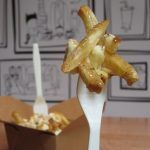 The recipe stays the same: perfectly golden fries loaded with cheese curds and gravy — yet somehow, they seem to have infused every bite with an ounce of goodness. Don’t believe us? Check it out for yourself. The title should be taken very literally. This fried rice is truly something special. It’s got shrimp, pork, egg, and duck, but the true star of the dish is (drumroll please) bone marrow. It adds serious depth of flavour to an already magnificent menu item and is well worth your time! Not a fan of the idea of marrow? Give it a try – we’re sure you’ll be delighted! 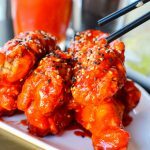 It’s almost like they’re wings, but these are practically good for you. Nothing like getting one of your five-a-day in with some buffalo sauce and crumbled bleu cheese! They’re bite-sized, zesty, and a perfect addition to your meal without going overboard or kick-starting the meat-sweats. This thing is absolutely enormous: two pounds of corned beef, creamy coleslaw or sauerkraut,Swiss cheese, mustard or homemade Russian dressing, and a giant loaf of sourdough! Not to mention it comes with two pounds of crinkle cut fries. There’s even a challenge that if you eat this within 30 minutes all by yourself, it’ll be totally free. Are you up for it? The only thing dirty about this addition will be your face after polishing off the plate. It’s loaded with Kennebec fries, burger mayo, green onion, caramelized onion, white cheddar ‘whiz, and red chilis for some punch. You’ll never look at a plate of fries the same way again. It’s perfect for sharing… or for chowing down on all by yourself, if that’s more your speed! Are you ready for this? Bring our cheddar apple pie home to your family. Taking pre-orders now for pickup on or before Dec 23rd. Email info@modelmilk.ca. While the traditional apple pie is always a fan favourite, Model Milk has decided to switch it up ever-so-slightly. They feature their delicate apples in a pie with cheddar crust and milk ice cream. The presence of salt keeps the dish from being overly-sweet and the milk ice cream cuts through like a hot blade. It’s a truly diversified palate and will be everything you want in a dessert. Good vibes, hot curries and killer beer on tap. Come hang with us tonight! Okay, okay, Calcutta’s whole menu is worthy of your time, and going for a taster of chutney seems a bit strange. However, once you’ve tried this little sampler, you’ll know what we’re on about. It comes with tomato kashundi, pineapple, cilantro-mint-kale, tamarind, coconut, and eggplant pickle tasters of chutney, and you’ll likely be finding yourself ordering another round. Whatever it is you dip (bread, spoons, or even fingers), you’ll be thankful for this dish. If this isn’t something straight out of a dream, we don’t know what is. Three types of cheese, mixed nuts and dried fruits, a berry compote, and house-pickled vegetables — all served while literally revolving in the sky. You’ll get all the best views, the best food, and be able to enjoy the best company along with it. Can’t even say this one? That’s not a problem. You just need to be the diner in this situation, and that’s the easy part. This dish is loaded with parma ham, cured mushrooms, Brussels leaves, and Reggiano before it’s delicately tossed in a truffle sauce. It’s rich yet light, with all the proper fixings to satisfy cravings you didn’t know you had. These are Mo Mo’s. Nepali food is delicious! Perhaps the cutest title for a dish on this list, that doesn’t mean it’s lacking in flavour! Prepare to be amazed by all of Himalayan, but particularly their Vegetable Momos. Fixed in a delicate wrapper, loaded with good ol’ veggies and cheese, and served with a perfect pair dipping sauces, these bad boys will have you wondering why you aren’t eating here every day. These delights are slightly healthier than your run-of-the-mill fried potatoes, but they’re still unbelievably delicious. Not to mention you can choose between four stellar accompaniments: tahini miso gravy, tzatziki, garlic aioli, or beet ketchup. Our recommendation? The garlic aioli. We promise it will be life-changing. We get it, you’ve had burgers before — but nothing like this. It’s got Silver Sage beef, Comté cheese, mushroom fricassée, butter lettuce, house-made ketchup, and aioli. This burger is the epitome of perfection… if you’re allowed to say that about meat on a bun. Just make sure to save room for their dessert crêpes. Aah, the quintessential French brunch dish. There’s no room for disappointment when you have Brioche French toast, an over easy egg, chèvre noir mornay sauce, cured ham, and roasted Poplar Blu potatoes all on one plate. You’ll feel transported to France, except you won’t have to pay an arm and a leg for your flight… or for your meal. Not sure where to get your late night foodie fix? We’ve got you covered every night of the week with our story about late night eats.